I collected some more data on three consecutive days this month and it reinforced my suspicion that the battery level gauge is not reading in a linear fashion. There is clearly a trend that when you use this calculation method when only using a portion of the battery, it yields a higher usable capacity figure. The other possibility is that because I am accumulating these miles over several trips, the efficiency number displayed on the Since Charge screen is not accurate. See the second chart. The other observation, now that I have added more data, is that the calculated degradation slope (linear fit blue line) has decreased from 5.5 Wh/day to 4.0 Wh/day to 3.3 Wh/day. You can also see the huge spread of calculated usable capacity from 18.9 to 21.0 kWh within those three consecutive days. Last edited by miimura on Fri Jul 14, 2017 3:32 pm, edited 1 time in total. 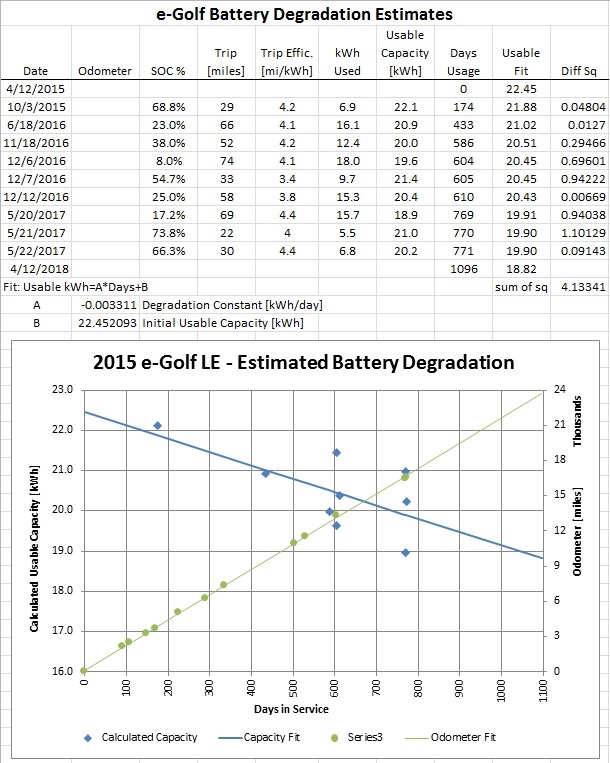 I am consistently showing in May of 2016 119 to 122 miles of range per recharge. I am averaging 6.0 miles to 6.4 miles per kwh, round trip, 26 miles, to and from my home. I am consistently finding that driving as soon as possible, within 5 to 10 minutes, upon completing a full recharge, adds 2 to 3 miles to my range on a recharge. Perhaps the battery is already pre warmed up and at optimum operating temperature? YMMV, currently, it's early in the heat wave of summer here in S California, I will be very interested in seeing how much degradation I observe by November or December, like I did in 2016. With this heat, I have decided I won't be doing much if any DC quick recharging during the warm weather, unless an absolute emergency, and I will quit it at 80% SOC. Really wish VW had provided more than passive cooling on the e-Golf battery pack. Pulling up and recharging over cooler pale grey cement pad sitting in the baking sun would be much preferred over hot black asphalt pad when quick recharging in any desert climates. YMMV, that is my thought process on improving the live of the battery and optimizing when you do DC quick recharge. I collected three more data points in the last week and added them to the charts. You will notice that the slope of the best-fit degradation line has decreased from 3.3Wh/day to less than 2.5Wh/day. I suspect that there was something different about the August 2017 data point. Maybe that was the day that my wife sat in the car with the A/C running during our daughter's piano lesson and it wasn't counted in the energy usage on the Since Charge screen. I also added the colored lines so that you can see which points have similar calendar dates. 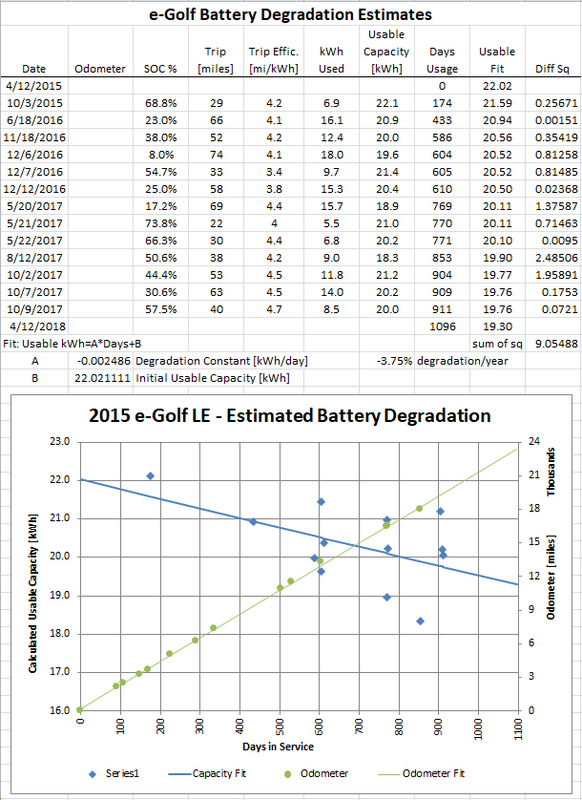 The nice correlation of battery amount used to calculated capacity is somewhat broken by this week's data. 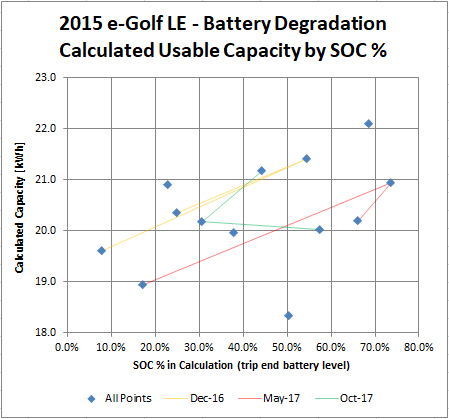 Mike, I can't find where I read it, but VW has stated that the 2017 has 88% useable capacity on their 2017 e-Golf 35.8 kWh battery, same as in the previous version in the 2015 and 2016 versions, or 31.50 kWh. Based on this percentage, for a 2015, a new battery has 24.2 x .88 or 21.29 kWh when new. Perhaps that would be a better starting point for useable kWh on your graph? I'm just trying to present the data that the car exposes to us. There is certainly better data stored in the car, but it's not available to us. Mixing data sources does not lead to a clearer picture of the situation. This method is far from perfect, as proven by the amount of scatter in the plots, but it does show the expected trend. FWIW, I show about 6.1 miles per Kwh over about 2400 miles, long term. I see 121-123 miles of range showing, consistently, since May of 2017. I have 13,300 miles now on the 2015 e-Golf, car turned 2 years in service 10-06-2017. If I am lucky, perhaps I'll see 19 kWh still in the battery after 4 years. I don't know how to link a graph so I'll just list the data. 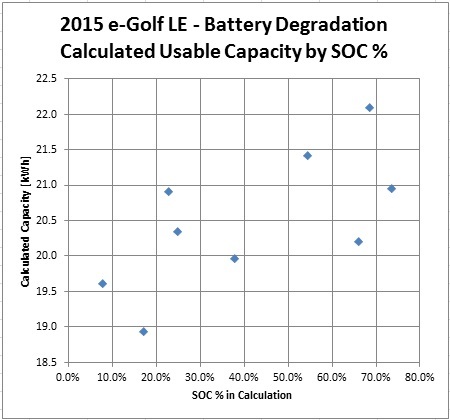 Also, I believe that the best way to estimate degradation is to calculate estimated capacity at a constant State of Charge (SOC) because I have observed the calculated usable estimated capacity decreases as a function of SOC. As my e-Golf is 2.5 years old (now at about 22,000 miles), assuming that it began with a usable 85% of the gross 24.2 kWh capacity (20.5 kWh), it looks like my car has lost about 1 kWh the first year and about another 1 kWh during the second year, so I expect that by the time I have to decide to buy it or turn it in at the end of the lease (next April), it will probably be at around 17 to 17.5 kWh usable capacity. That's about a 5% capacity loss per year. The VW battery warranty is 8 years or 100,000 miles against 70% capacity. At the rate my battery is losing capacity, it seems the car would get a free battery from VW at the end of 2018 or in early 2019 as 16.5 kWh usable is equal to 68% capacity. It will be very interesting to see how many battery packs VW replaces in 2019. Maybe they'll be the new 35.8 kWh pack? Only time will tell. I suspect that you're doing the math wrong with respect to the 70% warranty. I would expect VW to calculate the usable capacity at the time of claim and then divide it by the usable capacity when new. So, using your own numbers, 16.5kWh / 20.5kWh = 80.5%. So, that would not be a valid claim. My thinking is that the battery would have to drop from 20.5kWh to 14.35kWh before you could make a capacity claim. If the battery is truly degrading at 5%/year, then you could make a claim before the 7 year warranty runs out. However, you can see in my chart above that the Blue linear fit line has a slope of -3.75%/year. If it is truly linear and that is the correct slope, that would only be 26.25% after 7 years. Yes, I was getting a bit carried away with hopes of a new battery pack soon. You are probably right that VW won't calculate the 70% capacity as usable current/gross initial but as usable current/usable initial.